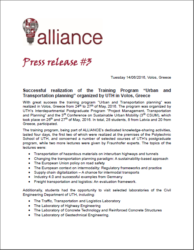 With great success the training program “Urban and Transportation planning” was realized in Volos, Greece from 24th to 27th May, 2016. The program was organized by UTH’s Interdepartmental Postgraduate Program “Project Management, Transportation and Planning” and the 3rd Conference on Sustainable Urban Mobility (3rd CSUM), which took place on 26th and 27th of May, 2016. In total, 28 students, 8 from Latvia and 20 from Greece, participated. Freight transportation and logistics: An evaluation framework. The Laboratory of Geotechnical Engineering.